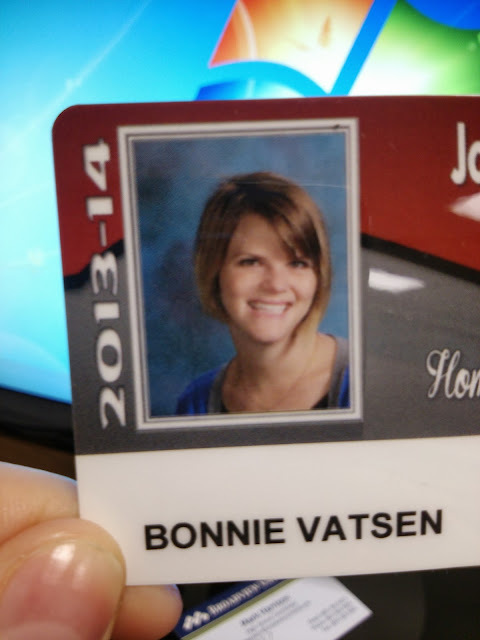 The Life of Bon: Mrs. Vatsen? Vatsen? Calling a Mrs. Vatsen? This is my new staff ID card. It's great! My hair looks real cute! I'm not doing one of those weird closed lip smiles that I've been into lately. But Vatsen? Seriously? VATSEN? Not even close to my real last name. Wouldn't you think that some higher up would have wondered when they were going through these ID cards, "Vatsen? Vatsen? We hired a Vatsen this year?" Nope. Apparently they have no clue who I am. It didn't help that the vice principal stormed into my room the other day needing to talk to me about a student. The kiddos were all at their desks working quietly on their prompts like they should be because I have freaking awesome classroom control. The VP stared at me at the teacher's desk on the teacher's computer in the honking huge teacher's chair. He looked me up and down and then gave me a big old crusty. "Where's your teacher?" he demanded. "I am the teacher," I replied. He apparently did not believe me. "Where's your badge?" "It's in my purse...." I pulled it out. Showed him. Only then did he seem satisfied. I was totally shocked. He really thought I was some student posing as the teacher, jacking her computer and sitting at her chair? I mean, come on! Maybe he was looking for Mrs. Vatsen and when it was just me, little old me , he got all kind of confused because I look nothing like Mrs. Vatsen and how dare I sit in Mrs. Vatsen's chair?! This is me at my teacher desk. I have a brown leather chair for crying out loud, you're telling me this doesn't look legit? Could someone really mistake this for a student? It was two years ago this month that I started blogging like a fiend. To celebrate, these are some of my very favorite of the first posts I did. Ah, it was a simpler time back then! + This week wasn't the first time I've been mistaken for a student- heck it's even happened in bathrooms before. + Another VP getting mad at me- this time for allowing my students to threaten the president. OOPS! + I was missing my old principal the other day and remembering fondly how truly terrible his grammar is. + A hilarious first writing assignment of the year. Those kids don't hold back. + The first thing I ever wrote about Greg, celebrating six months of marriage. We were such idiots then. This seriously makes me laugh out loud! I am also a teacher and thank goodness I teach 1st grade or I'm sure I'd get asked where my teacher is too! :) Are they going to give you another ID? I hope so! How did he not know who you were?? It seems like he would have been involved in the interview process. That is so weird. PS I like the darker hair a lot!! Oh my goodness! Well, glad you at least have one friend in the school. I mean....wow. I really did laugh out loud! Great writing, great story, great start to my Saturday! I always looked young at my old school too, but it helped that my students all had to wear uniforms :) And then, I was the "preggo" teacher, so no one bothered me anymore!! Haha! One of my students once said, "Ma'am, I can't take you seriously, I HOOK UP with chicks older than you!" Um....no. Wow... That's kind of.. not nice! I mean, the whole getting mistaken for a student part- yeah that happens to me, too, even after 4 years at the same school! Haha. But demanding your ID? Eeek! It could be worse….at least you have a fridge AND microwave in your classroom…..
At least you didn't get mistaken for a student while teaching at my school like I did...I mean, I teach 7th graders for heaven's sake! LOL I would take it as a compliment that he mistook you for a student. Looking young is always a good thing right?! Ha, that is EXACTLY why I don't teach High School.....for years whenever I went to a training at a high school campus they thought I was a student! Great picture! But that is too funny! I couldn't even teach at a middle school, because people would accuse me of being a student as well. Just take it as a compliment that you still could pass for a teenager! Great genes. LOL! Bonnie! You can be peeved off about that, you know. You can even feel peevish all day because of it. AND You can call the company with your pet peeve. LOL! You are so wonderful; I hope this has been your worst problem at your new school!